Kendrick Lamar : untitled unmastered. For regular readers of my hip-hop column, Da Art of Storytellin’, you know that I have a fraught relationship with To Pimp A Butterfly, an album I respect greatly but yet I still can’t get myself to listen to it. There was something about its universal praise, its anointment as an “important” album by, let’s face it, a largely white community of music writers that kept holding it and Kendrick Lamar up as the model of what rap should be, wagging a finger to the other rappers who don’t explore similar themes and sounds. None of this is Lamar’s fault, to be sure; I should be hating the game and not the player, but the fact remained the same: when push came to shove, I put on Vince Staples over To Pimp A Butterfly, I put on Drake or Future or BeatKing on over To Pimp A Butterfly. So I approached the release of untitled unmastered. with a mixture of apprehension and excitement, the same excitement I had as a big fan of good kid, m.A.A.d. city about to download To Pimp A Butterfly, even knowing that this release is a collection of demos from the Butterfly sessions. What if my general indifference towards Butterfly spread to these songs and then ultimately spread to Lamar himself? I didn’t want to be in a place to dismiss Lamar wholesale simply because I happen to be highly contrarian towards a largely white male world of music criticism (though, to be honest, we should all be so skeptical to such pillars). I still love listening to good kid, m.A.A.d. city, the specificity upon which Lamar spoke of Compton, his childhood, his adolescence; it was and still is a remarkable album. Butterfly is too, but somehow the cacophonous jazz-influenced album failed to grab me and I came away feeling that Butterfly was too weighed down by expectation and by Lamar’s own desire to say something of importance that it felt too careful, too calculated in a way. By virtue of being a collection of demos, untitled unmastered. skirts this carefulness and calculation. It’s indifferent to the expectations heaped on a follow-up because it was recorded at a different time. 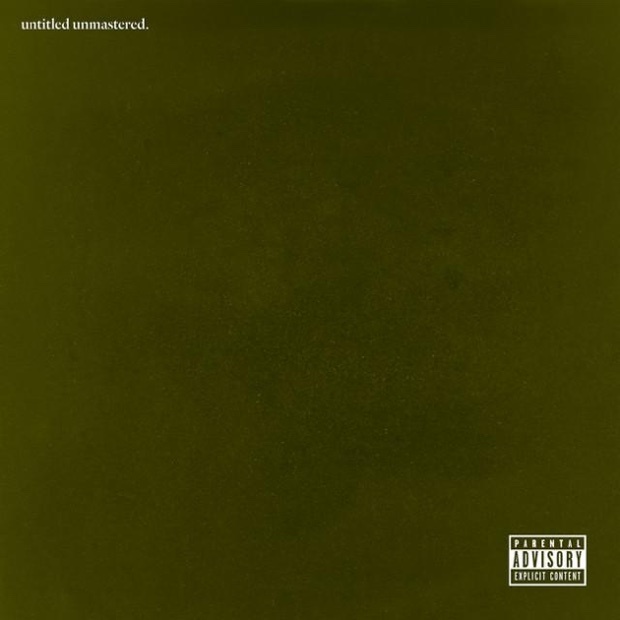 While demo collections can often feel uneven and incohesive—they are the tracks that didn’t make it to a single or album—untitled unmastered. feels whole; it doesn’t feel like a random selection of tracks. It exists within the same universe of To Pimp A Butterfly, the same throughlines of Afrofuturism, jazz, the recollections of spirituals infused into contemporary life, and yet because the tracks on untitled unmastered. were not necessarily meant to live together, they present a looser and more unexpected approach to the themes on Butterfly. And while that album was certainly rooted in the specificity of Lamar’s life, I often regarded it as about macro themes, however unfairly I came to those terms. Yet untitled unmastered. feels like a bridge between m.A.A.d. city and Butterfly, addressing larger themes of white supremacy and racism into his own specific stories and conflicts with the record industry, friends and family. Wrestling with his morality and the temptations of fame are not wholly new to Lamar’s music, yet “untitled 02 | 06.23.2014” brings an interesting complication. With his lyric of “I see jiggaboos, I see styrofoams,” Lamar lobs criticism at other performers who, in his mind, play into the negative stereotypes of black men for the consumption of white audiences. This invocation of respectability, also explored in “The Blacker the Berry,” puts Lamar in an interesting position. Is it not fair to also say this Lamar’s brand of politicized rap and respectability politics also fulfills the expectations of a type of white audience? An audience that gives side eye to Young Thug and Future, but throws heaps of praise on Lamar? That Lamar touches on this shows that maybe he’ll be willing to further dissect his positioning in the music industry. Like To Pimp A Butterfly, untitled unmastered. dives into Lamar’s internal conflicts—the doubts about personal success in the face of institutionalized violence as expressed in “untitled 05 | 09.21.2014”—but somehow this new collection feel more raw, less over-crafted and careful. While I do have a warmer reception to untitled unmastered. than I do to Butterfly, I am also aware of my own ambivalence to the music Lamar as crafted with his collaborators. The chaotic blur of percussions and horns feels overwhelming to me and I feel bad about that. And it’s not that I don’t like mess. I do. I’m a huge Kanye West fan for chrissakes. I love the rawness and blistering contradictions inherent in West’s music, so why can I not embrace Lamar’s sound in the same way? Why do I find Butterfly a little too soapbox-y and untitled unmastered. more diaristic, in a good way? Yet, these reservations are my own and for Treble readers, I recommend untitled unmastered., recognizing that your relationship with Lamar’s music might not be so fraught. Ultimately I am grateful that Kendrick Lamar exists. He seems to be on an extraordinary journey as a musician, and while I can’t always join in for more than a few initial listens, I’m glad he’s there doing it. Home Kendrick Lamar : untitled unmastered.